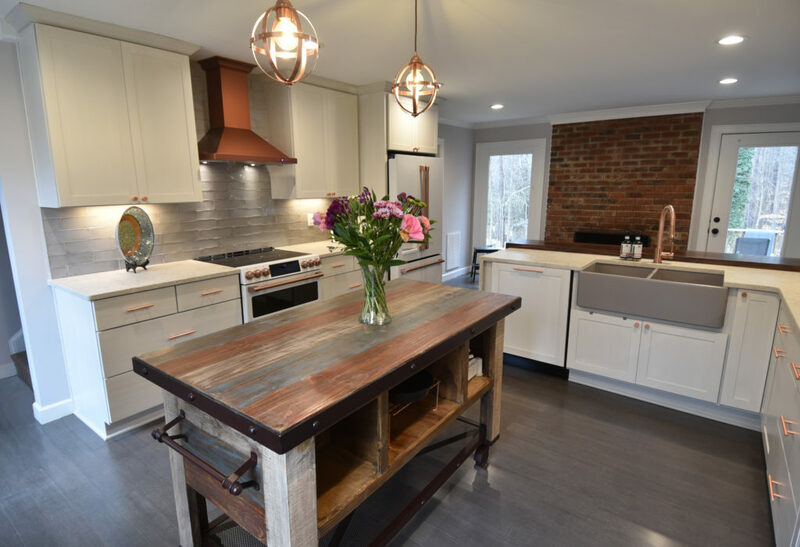 This kitchen transformed from a plain vanilla traditional style to a Rustic Modern Kitchen. 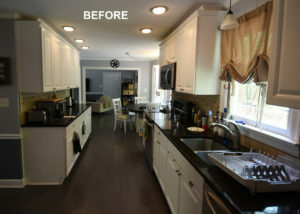 When we first met the homeowners at their home, we realized why they sought our help. 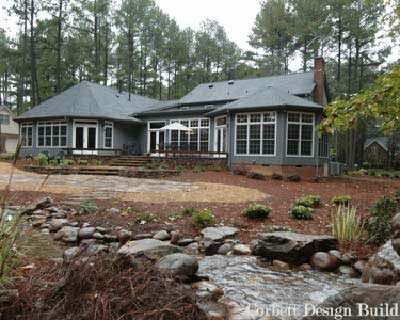 Their home had a drive-thru kitchen. 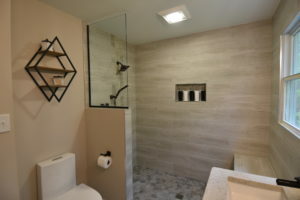 To make matters worse, the kitchen sink was in full view as you walked into the front door and the foyer dumped you into their narrow galley-style kitchen which was flanked by the family room on one side and the dining room on the other. 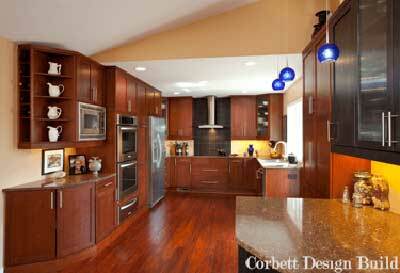 Their kitchen seemed to be an after thought and lacked work area and functional space. 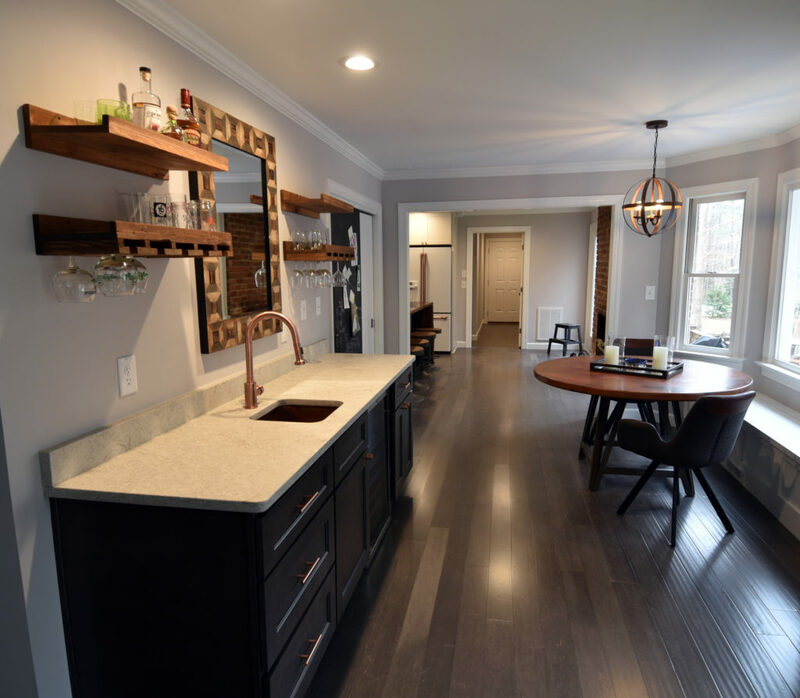 After considering several options, we determined that the kitchen would function much better where their existing family room was located. 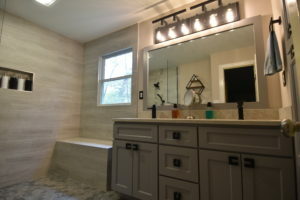 In addition, a new mudroom and storage space was added in the garage space providing much needed storage and drop off area for family items that can be out of sight. 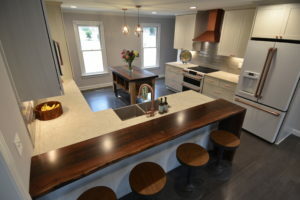 The new kitchen is much larger with many unique features including semi-custom cabinets with a gray glaze, Quartz and wood waterfall countertops, a furniture style island, gray farmhouse sink, GE Cafe Series appliances, a many touches of copper including the hood, faucet, hardware and appliance handles. 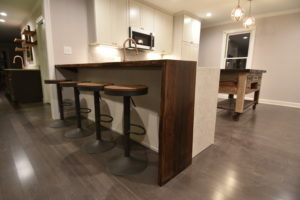 A wet bar, beverage center and custom banquette was added in the previous kitchen space. 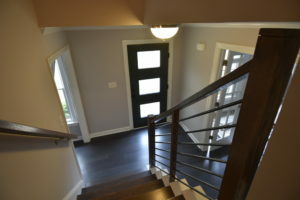 To make the home’s entrance more inviting, a French door was added and centered with the foyer drawing you into the space and bringing the outdoors in. 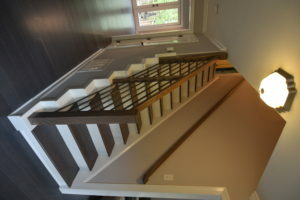 A new modern handrail and new stair treads were added. Space for the relocated family room was created by removing a wall between the existing dining room and front office. 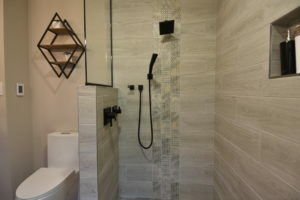 Their previous master bathroom layout was very tight and lacked much needed storage. 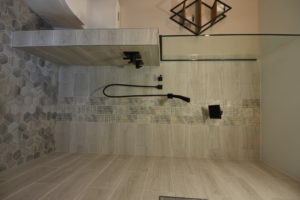 In order to add function to a small space, the toilet was relocated allowing for a large zero-entry shower. 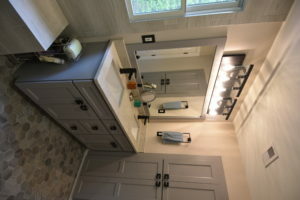 New recessed wall height cabinets were located in place of the previous master closet door which was off of the bathroom. 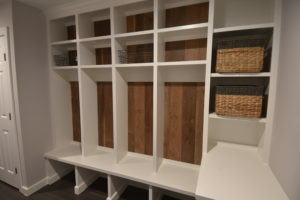 The new closet space provides lots of needed storage. 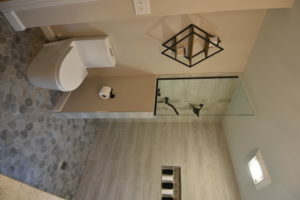 The master closet door was relocated to the bedroom and features a new barn door.